Cameroonian president Paul Biya casts his ballot while his wife Chantal watches during the presidential election in Yaounde, Cameroon Oct. 7, 2018. Paul Biya, Cameroon’s long-serving president, has been elected for a seventh term. Confirmation of Biya’s re-election has come a full two weeks after Cameroon conducted its presidential elections on Oct. 7. Biya, 85, has now been declared winner with 71% of the vote and will serve another seven-year term in office. Until the official results were announced, Cameroonians faced a deluge of various “results” across social media platforms including Facebook and WhatsApp. The election results, like previous elections, have already been contested by opposition groups and parties who claim the process was not free and fair. At the end of his next term, Biya will be 92 and will have led Cameroon for 43 years as president though he has headed Cameroon’s government since 1975 as prime minister under the president Ahidjo. 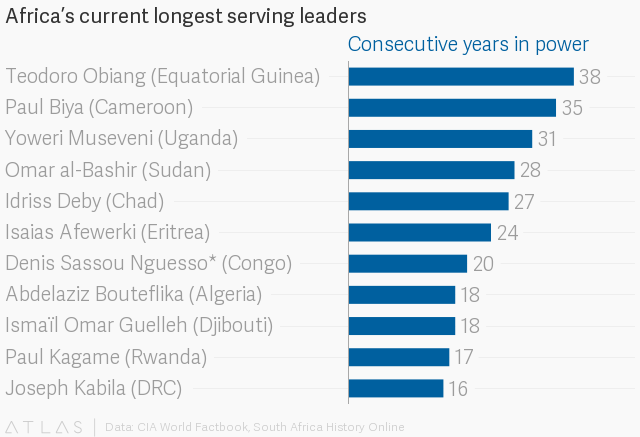 He features near the top of two peculiar lists of African leaders: he is currently Africa’s second longest serving leader behind only Teodoro Obiang Nguema of Equatorial Guinea and is also the continent’s second oldest leader behind Tunisia’s Beji Caid Essebsi, 91. History suggests Biya will likely be looking to fulfill his presidential mandate tucked away in luxury, far away from Cameroon. Earlier this year, an investigation found Biya has spent nearly five years out of the country on “private trips” and an extra year away on official visits. In 2006 and 2009 alone, Biya spent a third of both years out of the country. Biya’s private trips which are shrouded in secrecy have been met with protests at home and abroad. Local speculation suggests the trips, mostly to Switzerland, entail lavish shopping and some hospital visits—a common trend with African leaders. While the purpose of Biya’s trips are unclear, its steep costs are: the investigation estimates air travel and hotel fees at around $182 million. Cameroonian activists in the diaspora have at times protested outside his luxury hotel. Whether he’s away from Cameroon or not, Biya remains largely absent from government matters. His hands-off approach means Cameroon’s prime minister Philémon Yang is largely in charge of government business. Indeed, Biya has held cabinet meetings only twice in the three years, with both being down to a reshuffling of ministers. Biya’s re-election has come at a very difficult time in Cameroon’s history with rising tensions across the country’s Anglophone northwest and southwest regions. Over the past two years, peaceful protests over a lack of representation and being sidelined by the French-led national government have escalated into separatist movements for an independent region being responded to with military force leading to claims of genocide and fears of a civil war. Those tensions bred voter apathy as official figures pegged the turnout in the Anglophone southwest region at 16% while the International Crisis Group claimed the turnout was as low as 5% across both regions. There is also a longer running security crisis in the country’s far north which continues to face the threat of Boko Harm, as the terrorist sect, which has its roots in Nigeria, continues to operate across the Lake Chad region.